Nakhon Phanom (Thailand) – August 29, 2018 (travelindex.com) – The Mekong Tourism Coordinating Office has become known for innovative ways of organizing conferences in sustainable, inclusive, and environmentally friendly ways. During the 2017 Mekong Tourism Forum (MTF) in Luang Prabang, Lao PDR, topical mini-seminars matched with non-conventional venues across town, such as restaurants, river cruise boats, botanical gardens and rice fields, as well as museums and golf courses, making the event highly inclusive and experiential. 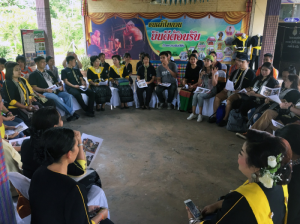 The 2018 MTF stepped toward inclusivity yet again by conducting its thematic strategy sessions in eight different rural villages with an aim to include local residents in discussions. The innovative idea came as part of this year’s ambitious theme titled ‘Transforming Travel – Transforming Lives’ and was conceived by 2018 MTF organisers, which included the Thailand Ministry of Tourism & Sports, the Nakhon Phanom Provincial Government, and the Mekong Tourism Coordinating Office (MTCO). Jens Thraenhart, Executive Director of the MTCO, said this initiative was put forth to compliment the higher mission of encouraging a sustainable, inclusive and environmentally-friendly planning platform. This initiative is also aligned with the ‘Greater Mekong Subregion Tourism Sector Strategy 2016-2025’, a ten-year strategy framework created and published by the MTCO in conjunction with each member county’s ministry of tourism with support from the Asian Development Bank. Host villages were Tai Ka Lerng, Tai Nyaw, Tai So, Phu Tai, Tai Guan, Tai Kha, Tai Seak, and Tai Isan respectively. Each village – located on Thailand’s side of the Mekong River in Nakhon Phanom province – hosted different strategic planning workshops with specific themes including organic tourism, gastronomy tourism, adventure tourism, religious tourism, festival tourism, wellness tourism, eco tourism, and heritage tourism. Workshops were led by subject matter experts to offer relevant knowledge to engage in discussion with MTF delegates and village residents. “Nakhon Phanom fitted particularly into a cultural ethnic experience,” said H.E. Itthiphol Kunplom, Vice Minister of Tourism & Sports of Thailand. “The city is at the crossroads of many cultures and thus became a place for settlements, traders and migrants over the centuries. The province is home to a dozen ethnic groups including Laotian and Vietnamese people,” said the Vice Minister. “It was so refreshing to see the efforts the villagers made to engage with the theme of transforming travel,” said Jeremy Smith, one of several keynote speakers for this year’s MTF. Through conducting years of research for his book ‘Transforming Travel – realising the potential of sustainable tourism’, Smith has collected a wealth of knowledge about how to optimise tourism opportunities in the twenty-first century. “The way the village sessions immersed us in the communities really epitomises the impactful approach that’s needed to help shape and transform tourism in the future,” he said. MTF delegates of each workshop were greeted with traditional food and welcoming ceremonies from village residents. This experience was meant to inspire creative tourism ideas that highlight and respect the rich culture of these rural villages. For most villagers, it was the first time they had interacted with international guests. Each host village received support and coaching to prepare for their respective workshop by the Thai Ecotourism and Adventure Travel Association (TEATA), which in Thailand helps two dozen local villages to develop sustainable tourism solutions. “Being Khmer, my experience at the organic tourism seminar was extremely enlightening,” said Chanrasmey Koam, Video Production Manager for Cambodian news outlet the Phnom Penh Post. “Our facilitator was so passionate and gave a sense of inspiration for local farmers to shift towards organic practices. His expertise and skill to engage with session participants inspired me to learn more and push organic tourism in my own country,” Koam concluded. The next Mekong Tourism Forum (MTF 2019) will take place in Dali, in Yunnan Province in PR China. Dali is famous for its beautiful mountainous landscapes along Erhai Lake as well as its old town dating back to the Ming Dynasty. The Mekong Tourism Coordinating Office (MTCO), located in Bangkok, was set up with funding from the governments of the six Greater Mekong Subregion (GMS) countries – Cambodia, the People’s Republic of China, Laos, Myanmar, Thailand, and Vietnam. The MTCO, which operates on annual financial contributions from each GMS country, acts as the secretariat for the GMS Tourism Working Group, comprising of senior officials of the six GMS countries’ National Tourism Organizations, to coordinate and facilitate sustainable tourism development of the GMS in line with the United Nations Millennium Development Goals, and promotion of the Mekong region as a single travel and tourism destination, in collaboration with the public and private sectors. The MTCO manages its award-winning MekongTourism.org digital platform as a one-stop platform to promote responsible and sustainable tourism in the region, as well as the annual Mekong Tourism Forum, whose hosting is rotated among GMS countries. Destination Mekong was created in 2017 to promote the Mekong region, comprising of Cambodia, PR China (Provinces of Guangxi and Yunnan), Lao PDR, Myanmar, Thailand and Vietnam as a single tourism destination to stimulate responsible and sustainable development and investment, and drive inclusive growth. Endorsed by the Mekong Tourism Coordinating Office and aligned with the mandate of the regional collaborative tourism framework of the six-member governments of the Greater Mekong Subregion, Destination Mekong executes targeted projects and initiatives via public-private partnership investment structures, including Mekong Moments and Mekong Trends.